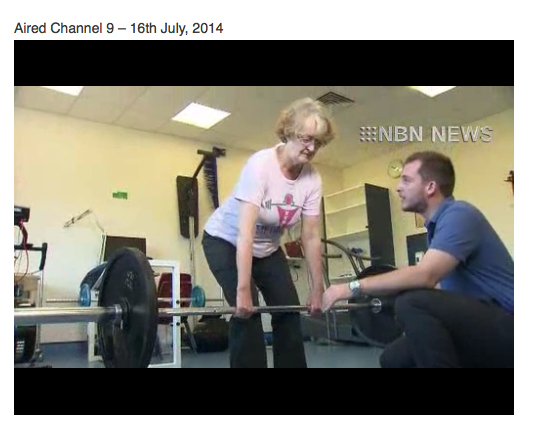 A controversial preliminary report was just published by Belinda Beck’s Australian research team with results of their LIFTMOR “Leap of Faith” Trial looking at 28 subjects performing HiPRT (High Intensity Progressive Resistance Training) in healthy community-dwelling older adults with low bone density (less than -1.0 T-score). Dr. Beck felt that their results were so surprising and important that they wanted to publish some preliminary results before the trial was completed. 28 women average age 68, with lumbar spine T-score -2.15 average have completed the study. INTERVENTION GROUP EXERCISE PROGRAM: The intervention group activities included 2x-weekly, 30-min, supervised HiPRT and impact loading with 8 participants per session. Bodyweight and low-load exercise variants with a focus on controlled movement were undertaken for the initial 2-4 weeks of training to ensure that the participants were fully trained with correct lifting technique. 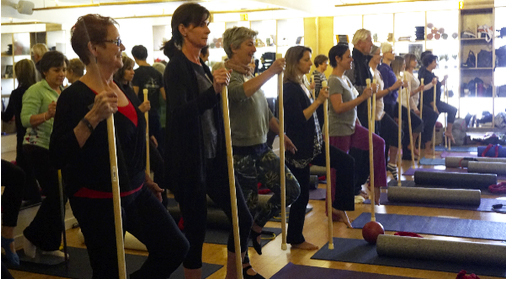 The participants were trained to avoid loading the spine in a flexed posture. Loaded exercises were then introduced and intensity progressed, so that all participants were able to comfortably perform the 4 exercises of the program (deadlift, squat, jumping chin ups/drop landings, and overhead press) by the end of the second month. The three HiPRT exercises (deadlift, squat, and overhead press) were then performed in 5 sets of 5 repetitions for the remainder of the intervention, progressively increasing weight to maintain an intensity of 80−85% 1RM. Impact loading was applied by jumping chin ups with drop landings. The participants started by reaching up to an overhead bar and gripping in an underhand, narrow grip chin up position. The participants then jump as high as possible while simultaneously pulling themselves towards or above the bar using their arms. At the height of the jump, the bar is released so that participants drop to the floor. 5 sets of 5 repetitions of the action were performed for the duration of the intervention. Progression of impact intensity was achieved by natural training-related increases in height of the jump and chin up, by raising the bar and by gradually increasing the intensity of the impact landing from a shock-absorbing flexed lower limb position to a more stiff-legged landing. The participants performed 2 sets of five deadlifts at 50−70 % 1RM to serve as a warm-up as required. All groups were fully supervised by an exercise scientist/physical therapist. CONTROL GROUP EXERCISE PROGRAM: Control group activities for the 16 participants included a very low-load home-based exercise program primarily designed for the purposes of participant retention, with the potential to reduce risk of falling (the latter for ethical reasons to address a duty of care to individuals who may be at increased risk of fracture). The control group regimen was similarly comprised of two 30-min sessions per week, consisting of a 10-min walking warm-up, four stretches, and four low-resistance exercises (lunges, calf raises, standing forward raise, and shrugs), with a focus on flexibility, lower limb muscle endurance, and balance, followed by a 5-min warm-down walk. The intensity of the resistance exercises was mildly increased by progressively adding hand weights (to a maximum of 3 kg) and increasing repetitions. RESULTS: The 12 participants that received HiPRT and impact loading showed improved height of 0.4 cm and improved femoral neck bone mineral density of 0.3%, and improved lumbar spine BMD of 1.6%. Functional performance improved in the INTERVENTION group in following areas of back extensor strength, gait speed, sit to stand leg strength, and balance as indicated by the functional reach test as compared to controls. The 16 participants that received low-intensity exercise showed the following: Height loss of -0.3cm, femoral neck -2.5, lumbar spine BMD -1.7, and functional performance decline in gait speed, leg strength and functional reach. They improved 17% in back extensor strength. Commentary: I think this is a greatly needed trial. I am thrilled to see that exercise may be proven to build bone mineral density without medication. However, I am concerned about the lifting technique (as seen in videos posted online- https://www.youtube.com/watch?v=9EZw_wrFnmI) that may predispose the participants to vertebral compression fractures. Outcome measures were taken via DXA and functional tests. I was pleased to see that they included standing height in the study outcome measures to monitor height loss due to vertebral compression fractures. I would have loved to see them include VFA, and Kyphotic Index pre- and post-trial to be sure that no participant had subsequent vertebral fractures during the study. I look forward to the results from the continuation of the study of the 354 subjects that will be entered into the trial! 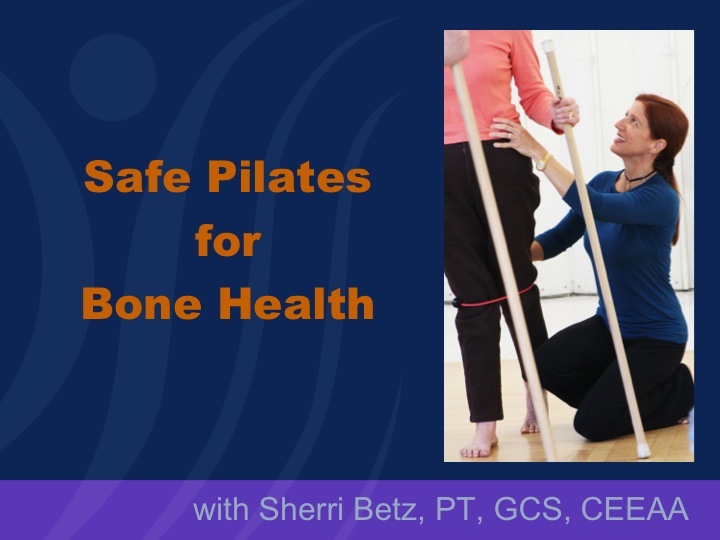 Created by Sherri Betz, PT, TheraPilates for Osteoporosis, is a comprehensive program for the fit and frail, adaptable for the clinical or Pilates studio environment or the neighborhood community center. 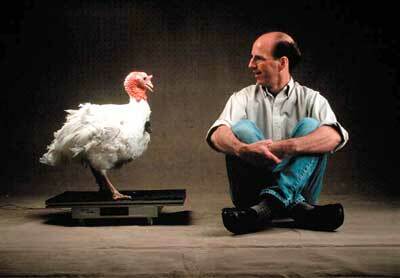 Dr. Tim Lohman, bone health researcher at University of Arizona and Terri Guido, PT from the BEST Study. Thank you for your participation in this wonderful, dynamic and enriching weekend! 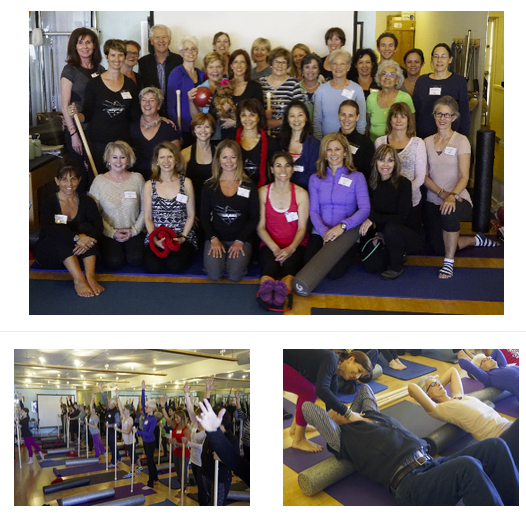 From leading researchers in bone health at the University of Arizona, to physical therapists, Pilates enthusiasts, Pilates instructors and athletic trainers, it was a pleasure connecting with such a diverse group of individuals from around the world! 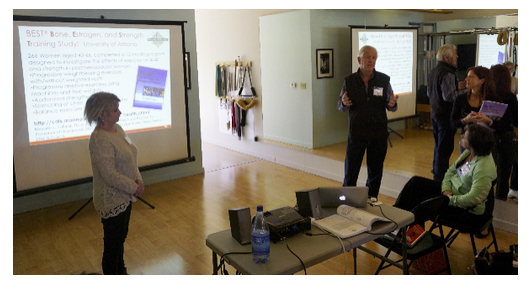 We immediately began to incorporate much of what we learned from Sherri into our sessions at BodyQuest Pilates. It is powerful to imagine the ripple effect that our group of 32 participants can have as we return to our own communities with the ability to apply current research in teaching effective exercise for bone health and avoid high fracture risk exercise for the osteoporotic patients or clients. Sherri, your work is empowering and inspiring, thank you! I would also like to say “Thank You” to Michele Franzella, PMA®CPT, who assisted Sherri throughout the weekend. That being said, Sherri will be teaching her course June 6th & 7th at her studio in Santa Cruz, California. She has graciously extended the Early Bird Deadline to Tuesday May 12th! If you know of anyone who is interested in participating in this workshop, please share this information with them. For TheraPilates Course Information and online registration click Here. For TheraPilates Course description, objectives and schedule click Here. Thank you for investing your time in this workshop! BodyQuest Pilates is committed to providing exceptional educational experiences for the clinical and movement practitioner. If you have any suggestions of workshops or presenters that you feel we should consider for future programing, please share your ideas with me. 174 men and women (89 active, 85 controls) were exposed to either 10 minutes of Whole Body Vibration (WBV) on a standing platform or a placebo platform daily for 2 years. At the 2-year follow-up, biochemical bone markers and bone density as tested by QCT did not improve. The results do not surprise me. I have never been a fan of vibration platforms for older adults…they are too expensive and can’t really be practically used for the masses especially if 1 in every 2 people over age 50 have low BMD. If they were effective for improving bone density in older adults and a vibration “floor” could be designed to vibrate 50 people at a time in a group class, I am all for it! Sounds like my gut feeling was right all along. We need to stop depending on devices and keep moving our own bodies against gravity! Click the link below to listen to the podcast and view the simultaneous slide presentation with Sherri Betz and Matthew Taylor. The podcast begins a the 6:00 minute time stamp so you can fast forward to skip the poll. Exercise for patients with osteoporosis: management of vertebral compression fractures and trunk strengthening for fall prevention. Sinaki emphasizes the need for stimulation of bone within bone’s biomechanical competence. She reiterates that compression of vertebral bodies can be insidious and that the absence pain is not a good indicator that fracture has not occurred. Exercise is an important part of management of osteoporosis and is associated with improved quality of life and decreased risk of fracture. Exercise programs need to address flexibility, muscle strength, core stability, cardiovascular fitness, and gait steadiness and should be individualized and interesting to the patient/client! She recommends axial strength and stability, and spinal extensor strengthening progressed with resistance. A good exercise program should also include balance and lower extremity strengthening. She also states that oral Vitamin D and Calcium supplements can enhance the effect of strength exercises. Inspired by the AmGen Tour of California, coming through Santa Cruz, I am thinking about the bone density of the world’s top cyclists. In the past 5 years, much has changed in the way we think about exercise and bone density. We used to think that weight-bearing or weight training exercise was the best for building bone. So, just what exercise is best for building bone? And, what can avid cyclists do to preserve their bones? We understand that bones need unique forces to stimulate osteoblasts to make new bone. Exercises that involve repetitive activity, such as swimming, paddling, running, and cycling, work well at first, but their effects are diminished over time and eventually can lead to bone loss. Swimming actually decreases bone density and a study of water polo players showed that over the season, the players lost bone density in their legs and gained bone density in their arms! (Kavouras, 2006) Swimming simulates a low gravity environment like being in space. Astronauts lose bone density at an alarming rate while in space. Many drugs were originally developed for astronauts to prevent bone loss. Obviously, the space program has a lot of money to devote to this type of research. Cycling is a close second to swimming in the bone density race. It is only a little better than swimming and much worse than running in building bone. (Rector, 2008) Cycling is non-impact and repetitive and the more cycling the less responsive the bone. Competitive cyclists generally don’t do any weight training to be as light as possible. Cyclists stay in rounded spinal positions for long periods of time which can be detrimental for putting the spinal vertebrae at risk for fractures in those with low bone density. Ever seen the cyclist’s humpback? Another aspect to consider with repetitive high-intensity exercise is the fact that muscles need calcium for contractions and when the calcium stores run out in the bloodstream, where do the muscles get their calcium? From the bones! Bones are the storehouse for the body’s minerals: calcium, magnesium, boron, manganese, zinc, potassium, copper, etc. Vitamin D is also very important for absorption of calcium. For some mysterious reason, studies have shown that worldwide, people are low in vitamin D levels. If you cycle many miles per week, replace your calcium with at least 1500 mg per day and take 1000 IU’s of Vitamin D (this RDA recommendation has increased from 400 IU’s). Let’s put the best exercises for building bone in order: gymnastics, volleyball, soccer, high-impact aerobics, tennis, strength training, running, cycling and swimming….you get the idea. If you are going to start strength training….How many repetitions? How much resistance? How often? Repetitions: A set of 10 repetitions should be very difficult to complete if you are training at the right weight and training for strength. If you can complete 20 repetitions, the weight is too light and won’t build strength or stimulate bone. Resistance: For lunges, squats and back extensions use the heaviest weight that you can lift 8-10 times. Frequency: Anywhere from 1-3 times per week sessions of weight training or high impact exercise has been shown to stimulate bone. Dynamic High Impact Exercise: Adding some weight-bearing dynamic high impact activities would be a good idea for cyclists to incorporate in their training programs. Since cycling does not include impact, I think that this type of exercise is imperative for the devoted cyclist in preservation of bone density. FYI: Walking does NOT build bone! Whatever you do, don’t quit cycling, especially if it makes your heart sing! One study showed that the bone density of exercisers as compared to non-exercisers can be exactly the same, but the quality of the non-exercisers bone is different. The bones of exercisers are stronger and less prone to fracture! (Tolomio, 2008) Bone quality is very difficult to measure, is very expensive to measure and puts one in the vicinity of high doses of radiation. So keep cycling, add a little impact exercise, take extra calcium and Vitamin D and enjoy life! If you have any questions about this article or about bone health, feel free to write or call 831-476-3100. 1) Barry DW, Kohrt WM. BMD decreases over the course of a year in competitive male cyclists. J Bone Miner Res. 2008 Apr;23(4):484-91. 2) Campion F, Nevill AM, Karlsson MK, Lounana J, Shabani M, Fardellone P, Medelli J. Bone Status in Professional Cyclists. Int J Sports Med. 2010 Apr 29. BMD was measured in 30 professional road cyclists mean age: 29, height, weight, fat mass, VO(2) max as compared 30 young healthy males used as reference with similar characteristics as well as calcium intake. Bone density of the skull was similar but in arms, legs, spine, pelvis, and femoral neck the cyclists were significantly lower. The femoral neck was 18% lower in the cyclists. 3) Kavouras SA, Magkos F, Yannakoulia M, Perraki M, Karipidou M, Sidossis LS. Water polo is associated with an apparent redistribution of bone mass and density from the lower to the upper limbs. Eur J Appl Physiol. 2006 Jun;97(3):316-21. 4) Rector RS, Rogers R, Ruebel M, Widzer MO, Hinton PS. Lean body mass and weight-bearing activity in the prediction of bone mineral density in physically active men. J Strength Cond Res. 2009 Mar;23(2):427-35. This study showed that long-term running and resistance training increase bone density while cycling does not. 5) Rector RS, Rogers R, Ruebel M, Hinton PS. Participation in road cycling vs running is associated with lower bone mineral density in men. Metabolism. 2008 Feb;57(2):226-32. Cyclists had significantly lower BMD of the whole body and spine than the runners, despite having similar age, weight, body mass index, body composition, hormonal status, current activity level, and nutrient intakes. 63% percent of the cyclists had osteopenia of the spine or hip, compared with 19% of runners. The cyclists were 7 times more likely to have osteopenia of the spine than runners, controlling for age, body weight, and bone-loading history. 6) Sinaki M. The role of physical activity in bone health: a new hypothesis to reduce risk of vertebral fracture. Phys Med Rehabil Clin N Am. 2007 Aug;18(3):593-608. Sinaki discusses her research in spinal extension exercise and increased bone density of the spinal vertebrae. 7) Smathers AM, Bemben MG, Bemben DA. Bone density comparisons in male competitive road cyclists and untrained controls. Med Sci Sports Exerc. 2009 Feb;41(2):290-6. Cyclists had lower bone density than age and body-mass matched controls even with higher calcium intake. 8) Tolomio S, Ermolao A, Travain G, Zaccaria M. Short-term adapted physical activity program improves bone quality in osteopenic/osteoporotic postmenopausal women. J Phys Act Health. 2008 Nov;5(6):844-53.